Ancestral Discoveries: Where in the United States Is Dave? Where in the United States Is Dave? I believe in "whole family research." This means that I research not only my ancestors but also their siblings, spouses, and sometimes further out. I do this because you don't always find the answers to questions such as parents' names in your ancestors' records, and also because you get a fuller, richer picture of what your family was doing and how people interacted when you look at everyone in the family. When I started working on my Brainin line, I ran into a lot of problems. First, as is common in general, the name was spelled all kinds of different ways. It particularly showed up a lot as "Brennan" and similar spellings, which caused all kinds of confusion, becuase most of those were Irish or English, whereas my family were Jews from Russia. But over time, as I worked through multiple censuses and as more finding aids (such as online databases) became available, I found all of my family members in almost all the censuses after they arrived in the United States. I had found Dave (Dovid) arriving at Ellis Island with his sister (my great-grandmother) Sarah and their older sister Lena on the Caronia on August 2, 1905, so I knew he was here before 1910. (I even found the three of them on a Special Inquiry page, listed as likely public charges, because they were two young unmarried women and a teenage male with no skilled trade.) I had found all the other family members in 1910. They were all living together at 236 East 103rd Street in Manhattan — my great-great-grandparents Max (Mendel Hirsch) and Rose (Ruchel) Brainin with their children Lena, Sarah, William, Bessie, and Benjamin — except for the oldest son, Max, who was already married. He was living at 101 Columbus Avenue in Manhattan with his wife, Nellie, and their son, Sidney. 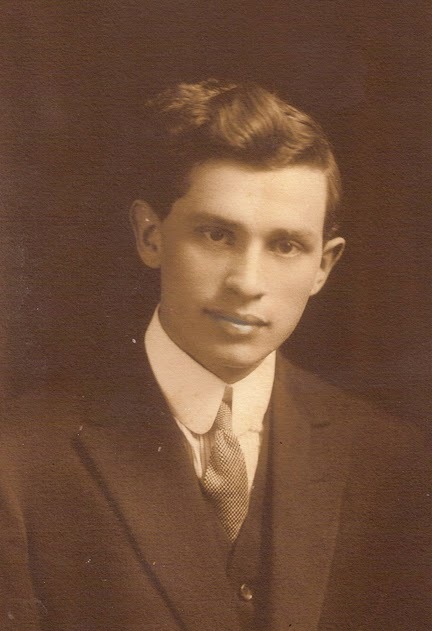 I found Dave in 1920, still living with his parents. This time they were at 1575 Madison Avenue in Manhattan, the address my grandmother remembered for her grandparents (and where she was born). I have a copy of his 1927 marriage license, again in Manhattan. His children were born in Manhattan in 1929 and 1931. By 1940 the family had moved to Cumberland County, New Jersey. But where was he in 1910? Everything I knew about the family in general, and about Dave in particular, was associated with New York and New Jersey. I turned the search pages on Ancestry.com upside-down and sideways trying to find Dave in one of those states. I tried variations of first and last name, first name only, last name only. I tried birthplace and age with no name. I bought a copy of the New York City 1910 index that was available on a CD and checked it. I went crazy going in circles. But still no Dave. At this point I thought about just giving up. After all, I had several records attesting to Dave's life in this country. I knew when he arrived, where and when he was married, where his children were born, where he died and was buried, even when he adopted his nephew. I didn't really need to find him in 1910. I knew he had to have been here then. I was pretty darned sure he hadn't traveled back to Russia to visit, since the whole family had come here. But I'm stubborn. I wanted to find him. I wanted to know why he was hiding from me, laughing at me. So one day, after having unsuccessfully tried some new permutations of the search, I thought, "Well, why don't I just look around the whole country? It couldn't hurt." And instead of restricting the search to only New York or New Jersey, I looked through the whole U.S. And what did I see? Hey, who's that in . . . San Francisco?! That couldn't be Dave, could it? I looked at the census page itself. The address was 1018 Webster Street (which no longer seems to exist, but the San Francisco African American Chamber of Commerce is at 1006 Webster). It sure looked like Dave — age, birthplace, arrival in U.S., occupation, all jived with the information I knew. But what was he doing in California? I still wasn't sure it was Dave, but keeping in mind the possibility that it could be, I looked for other possible records for him out west. 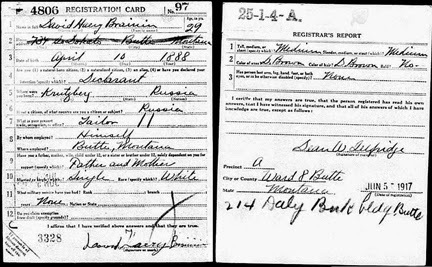 I found his World War I draft registration — in Butte, Montana. I found an index entry for a naturalization — in Washington State. After obtaining the naturalization (a fast-tracked U.S. Army one at Camp Lewis that didn't have much information in it) and piecing everything together, I was very sure it was my David Brainin. There were no conflicts in information. Apparently, he was the only member of the family who heard the call of "Go west, young man" and left the East Coast to see more of this new country to which he had immigrated. He was out west at least between 1910 and 1918. And by 1920 he was back in New York with the rest of the family. Considering all the stories about the family I heard while I was growing up, I was surprised that I never heard about Dave's adventures out west. No one ever mentioned it. And at this point I suspect that no one still alive would really know why he did it. I did learn a valuable lesson in searching for Dave in 1910 — people aren't always where you expect them to be. And as usual, I want to find more. For example, since I live near San Francisco, it would be cool if I could find a photo of the building Dave used to live in, and maybe other records from when he was here. But I'm happy I finally found him in 1910 and learned a little about his travels out west. And I don't think he's laughing at me anymore. After I had found these records, I came into possession of several photographs that belonged to my grandmother. Amazingly enough, one of the photos was of Dave, taken in Butte, Montana. I do the same thing - research siblings and their children. One good result is finding cousins from those lines from blog posts about my grandparents siblings. And sometimes I find their parents living with the siblings in later years. I also have a few people that disappear for a census and then reappear. I think spreading out the search geographicaly is a technique I'm going to try. That's true, finding cousins is another great benefit of researching the whole family. They also often have additional information and sometimes photos and documents to share. Thanks for commenting! If you do find out more about Dave, I'd be interested in hearing about it. 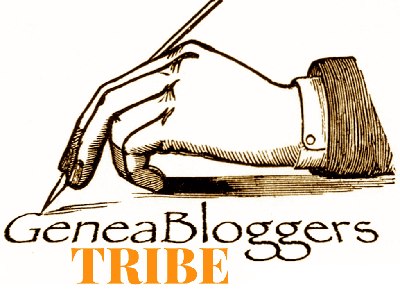 Follow up blog posts are fun to read. I'm Going to RootsTech and the FGS Conference!